Jagwire USA and its partner distributors will unveil a new pink cable housing by donating a portion of the proceeds to benefit breast cancer research. The housing, which will be available in September, was developed as part of Jagwire's initiative to raise awareness about breast cancer and inspire charitable giving. "Jagwire has a tradition of supporting charity and advocacy efforts," said Jason Grantz, director of aftermarket products for Jagwire. "The pink housing promotion is an opportunity to help advance research that can save lives." In addition to the ongoing charity effort, the company will make a limited number of kits available to dealers during the Interbike and Eurobike trade shows. At that time, dealers can obtain one kit per $25.00 contribution. Jagwire will donate all the money to various breast cancer research organizations. Participating dealers can have the funds given on behalf of their store. On a more local level, Jagwire is also encouraging bike dealers to donate $1.00 from each kit they sell in their shops to breast cancer research or to a charity they already support. According to the American Cancer Society, about 212,000 cases of breast cancer were diagnosed in the United States in 2005. The World Health Organization reports that the incidence worldwide exceeds more than 1.2 million people every year. While advances in early detection and treatment have greatly improved the chances of survival, more than 40,000 women die from breast cancer in the United States each year. Globally, the disease claims more than 400,000 lives annually. 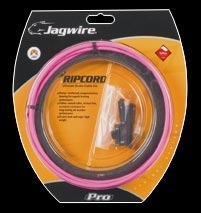 To learn more about the Jagwire breast cancer awareness initiative visit www.PinkCables.com. Jagwire is among the world's largest producers of cables and housing for bicycles. Jagwire serves the entire cycling industry; from individual retail shops to large bike companies including BMC, Giant and others. Jagwire distributes its products all over the world from production facilities in Taiwan, China, and Belgium. Sales and marketing is handled by Jagwire USA, headquartered in Bloomington, MN.